A favorite in our household, these savory bites are filled with curried onion and shallow fried. I have made this Mini Samosa in the past and now craving to eat them now. This time. I choose red onion to be stuffed in my samosa. Make my Mini Onion Samosa smaller than the regular ones, it was just nice for one bite. Feel free to vary the size by dividing the dough into lesser balls for bigger samosa. Also used a combination of plain flour and whole wheat flour that yield a slightly darker shade than the normal samosa. The onion stuffing was seasoned with chili powder to add some punch but you can decrease or increase according to your tolerance. As you know. regular samosas are deep fried but I prefer to shallow fry them. 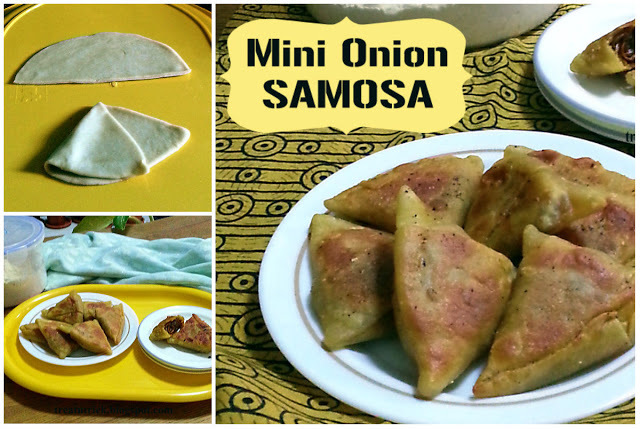 This does not affect the taste of this Mini Onion Samosa at all, they are still turned awesome. Come, enjoy these bite-sized beauties with a cup of your favorite drink. Place both flour and salt in a mixing bowl. Add in oil and water gradually to form into soft dough. Keep for 30 minutes. Heat the oil, add in cumin seeds, fry until fragrant. Add in onions, sprinkle chili and turmeric powder, salt. Stir for 2-3 minutes, remove and cool. Roll out each ball on well floured surface into thin circle about 1/8 in thick, cut into half. Shape the semi circle dough into a cone, overlapping each other. Glue the seam together with a little water. Fill up the cone with a tablespoon of filling. Brush the edges with water, press together to seal. Complete the rest of the dough. Heat about 1 in deep of oil using medium heat. When the oil is hot, slide the samosa and fry until golden brown, turning frequently. Do not crowd the pan. Remove with slotted spoon and drain on kitchen towel.